Fragments is an event—an unforgettable book that will redefine one of the greatest icons of the twentieth century and that, nearly fifty years after her death, will definitively reveal Marilyn Monroe's humanity. Marilyn's image is so universal that we can't help but believe we know all there is to know of her. Every word and gesture made headlines and garnered controversy. Her serious gifts as an actor were sometimes eclipsed by her notoriety—and by the way the camera fell helplessly in love with her. Beyond the headlines—and the too-familiar stories of heartbreak and desolation—was a woman far more curious, searching, witty, and hopeful than the one the world got to know. Now, for the first time, readers can meet the private Marilyn and understand her in a way we never have before. 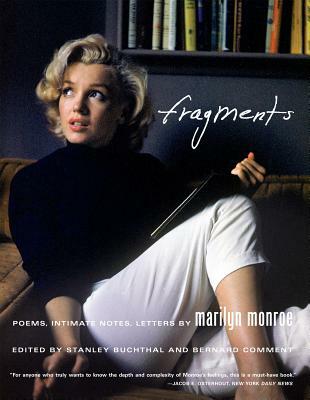 Fragments is an unprecedented collection of written artifacts—notes to herself, letters, even poems—in Marilyn's own handwriting, never before published, along with rarely seen intimate photos. Marilyn Monroe was the defining actress of her age. Born in Los Angeles in 1926, Monroe first gained notice for small but memorable roles in The Asphalt Jungle and All About Eve in 1950. Over the next decade, she starred in numerous films, including Gentlemen Prefer Blondes, Some Like It Hot, How to Marry a Millionaire, and The Seven Year Itch. Acclaimed for these and many other performances, Monroe also studied with Lee Strasberg at the Actors Studio. Fragments, a book of her poems, notes and letters, as well as rare photographs, shows the little-known personal side of this icon. Monroe died in 1962.